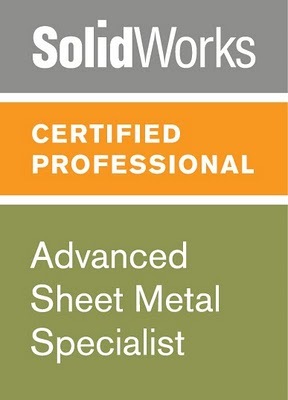 Learning to become a Certified SOLIDWORKS professional? Get sample exams, tutorials & online training now. first up I’m going to run through the tutorial built into the software. Here is what it says I’ll learn. The CSWP-Sheetmetal Test covers a few other things as well. I’ll review them in subsequent posts (linked below) but first what’s to learn from the tutorial. 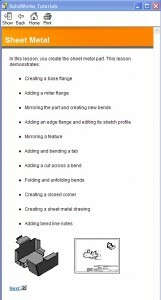 The first thing to note about Sheetmetal is that there are a lot of variables. This is evident by the start of the design tree. 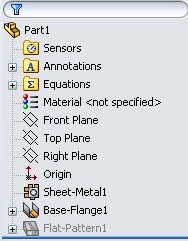 To start any sheet metal part a base flange is created which, after first created, actually inserts 3 features into the feature tree. These contain information for the material being used (thickness/gauge), how it will bend (bend radius), the base sketch, and a layout of how the part will fold flat (as sheet metal is made out of a flat sheet). Finish up the study, take a look at the practice exam and it’s time to get a certificate. As I have gone through studying for this test I keep finding more and more helpful resources, not one to hide good information I will include them below. Some of these are outdated tutorials but still helpful. Solidworks Resources for teachers- Sheet metal. 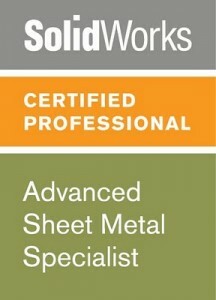 Become a Certified SOLIDWORKS professional fast. Get tutorials & online training now. Can I be the Solidworks World Official Internet Correspondent.